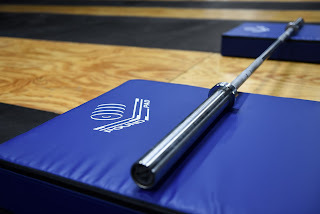 The original "Pound Pad" and the product that let us sleep at night without fear of email, phone and neighborhood harassment due to dropped barbells in our gym. Our noise & vibration killing pads are each sized at 24" x 30" x 5" (sold as pair) and will give you a whole new level of peace and quiet. Sized perfectly to allow for a safe amount of space to drop barbells onto but still easy enough to store, carry and move around the gym. Fire retardant, high impact approved, non-skid bottom, indestructible handles, military approved casing, made in the USA (Chicago). The Pound Pad is sold as a pair and includes a 1 year warranty which makes this the one stop shop to remedy your noise and vibration complaints immediately. We innovated the Pound Pad after years of dealing with angry neighbors; both residential and commercial. We were dealing with threats of eviction, lawsuits and fines from the alderman, police, local businesses etc... all from the noise we were creating from heavy barbell drops in our CrossFit classes and Weightlifting Club. It took us over 18 months of testing everything and anything we could find that would help diffuse and/or solve the noise and more importantly the low frequency vibrations that came with dropping heavy weights on a floor that was shared with neighbors and local businesses. We are a small company, going on our 3rd year of selling Pound Pads. We have been saving businesses from closing their doors, evictions, lawsuits and have allowed small companies like ours to continue to focus on their clients instead of worrying about the next heavy drop and what type of negative attention that comes with making your neighbors unhappy. Next up is our 2nd product for the Strongman community. A larger, more durable Pad that will withstand the aggressive nature of Strongman equipment like Stones, logs, axels, kegs, etc.. We are trying to launch that product by the end of the 2nd quarter this year. This is the end of floor damage and dropped weights sounding like the ceiling is coming down with them. Pound Pads are extremely tough and can take a beating. But they are also extremely pliable. This is extremely helpful for those doing high impact workouts. The feeling is firm and supportive, yet forgiving, resulting in reduced stress on your joints. This foam is able to take immense amounts of pressure, yet remain rigid. It's actually pretty cool to see because when you pick it up, it feels like a hard block of rubber. This foam is designed to take repeated abuse and keep on suppressing sound. The cover features a non-skid bottom to keep it from shifting when weights are dropped, and it does a pretty good job of meeting its claims. 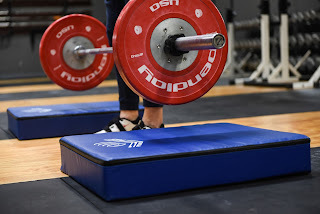 The cover is available in two different colors, black and blue, The Pound Pads are the best option for reducing noise from dropping weights that we've found and although they're a bit pricey, we still highly recommend them.